In three months Matt Manning from Xenia, Ohio transformed by dropping 40 pounds, which led to a $50,000 grand prize win. As reported by WDTN 2 News, Manning’s motivation to change stemmed from some developing health issues and the realization that he had stopped being active with his kids. “I had had a few health scares, where I passed out, had to go to the ER by ambulance. Then also had some chest pains like six months later and then my dad had to have a heart valve transplant. So that really woke me up,” said the 45-year-old father and engineer. 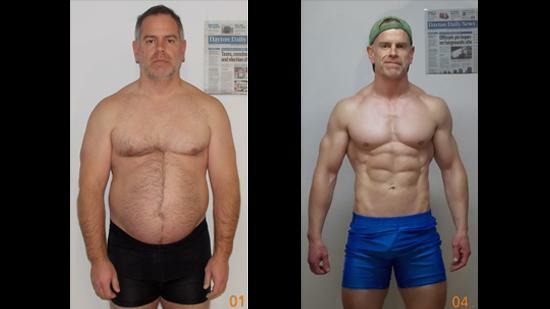 He decided to enter a 12-week fitness competition called the ‘$100,000 Transformation Challenge’ held by fitness website Bodybuilding.com . One male and one female with the best body transformations would each win $50,000. Manning took the challenge seriously and altered his lifestyle by incorporating healthier food choices, portioning meals, and adding exercise to his daily routine. He told the station that it wasn’t easy but he had the support of his wife and family. “They said I look like a superhero now (laughs) which is, when they saw the after pictures. My daughter saw the after pictures she’s like, ‘Man you look miserable. I’d be miserable too if I looked like that,” said Manning. The hard work paid off. Bodybuilding.com representatives surprised him at his gym with a personal announcement that he was the 2014 winner and apparently presented him with the prize money in a gym bag full cash. The female winner, Robyn Koolen from Alberta, Canada was presented with an oversized check. The contest winner attributes a big part of his transformation to his wife and said he’ll use the prize money to treat her.